The changing business climate and complexity of data networks have companies reevaluating data recovery needs. Titan provides businesses with the experience and expertise to optimize the security of their life blood, data. Titan’s Online Backup and Recovery Service provides a safe, automated backup, archiving and retrieval solution for your local area networks (LAN) and wide area networks (WAN). The process is fully automated and significantly reduces and/or eliminates the handling of backup tapes and other backup media, making it very attractive for the security of business or personal data. Encrypted on-line backup is fully redundant and is automatically stored off-site. Titan provides a cost-effective, safe and fully automated way to restore data with minimal interruptions. 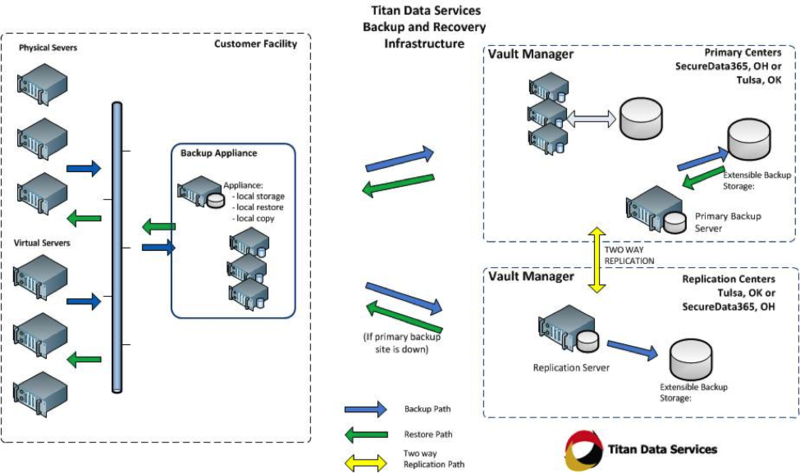 Titan’s multi-platform ability and scalable storage abilities can be tailor-made to match individual business needs. The ability to operate on numerous operating systems provides Titan with the flexibility to give our clients a sense of security often absent in this day and age. System administrator tool to monitor all backup operations.